It is HARD,hard indeed to come back from a fun-filled and joyous wedding celebration,and more difficult when you just enjoyed all the fun in double.Yes,I am talking about my brothers' wedding celebration and all the drama..lol.But to be honest,I am coping up well.Except if you count the pending works to be done for me to function fully well in the kitchen and otherwise.Browsing the net and blogging must be something I have no qualms to be doing now despite the halo of laziness surrounding me,heheh. I've been doing zero amount of cooking back home,so to resume blogging I am taking someone's help,just like this one. If last time it was her,this time it is my Sis-in-law Radhika,who is an amazing cook.The way she goes about cooking delicious dishes back to back,I am sure my amma is going to get a much needed break from the kitchen!! Mix together atta,salt and hot oil till the mixture resembles bread crumb like consistency.Add enough water to make a stiff dough[like for poori]. Soak urad dal for 20 minutes. Grind together the soaked[and drained]dal,grated coconut,green chillies,ginger and salt to a coarse mixture without adding water. Make small balls of the dough and the filling and keep aside. Using a rolling stone,flatten the roti dough a little and place the filling inside. Close the sides carefully and loosely shape into round discs. Flatten the balls into thin rotis without giving much pressure using enough flour to dust. Deep fry in hot oil till it bubbles up and browns evenly on both sides. A very new recipe for me and it looks lovely and I know what you mean by getting back to the old routine after all the fun, but we have to do it. these are so new to me..ya I know.a wedding can be so hectic but fun..but getting back to daily life is something else! nice interesting recipe..will sure try this one soon..
delicious and tempting biscuit rotis. Hi. Nice version dear, would love to try. Oh yeah,wedding can be so much fun!!! !This recipe is very new to me.Looks yum! 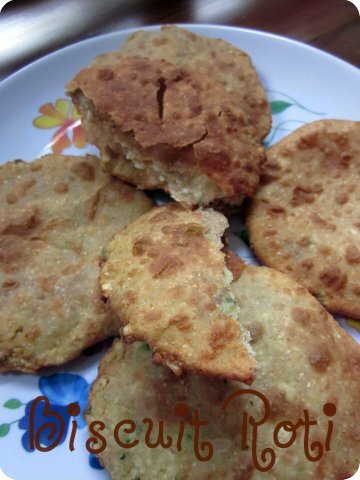 Very new roti for me too, glad to see u back..
first time visiting ur blog ,u got a lovely space here ..
this biscuit roti is a new recipe for me ,looks delicious n tempting...yummy stuffing .. Very nice. We can make this for a snack at home. Welcome back Divya! !Lucky gal to have a sis-in-law who can dish out and pack such yummy things.. sounds really good and perfect for a packed lunch..
very different recipe and wholesome too. One of the first recipes I posted... an absolute favourite! This looks really good, Divya. A previous cook used to make this. Thanks for the recipe + memories! hey first time here...awesome photographs..look so tempting....hope to try ur dishes soon. This is really interesting one divya.. i loved this recipe will surely try it out.. I am simply drooling seeing the recipe itself.. yummy!!! thanks to ur vanni for sharing this..